A down version of Fjällräven’s most timeless jacket with contrasting colours over the shoulders and sleeves and leather details. Greenland No. 1 Down Jacket is based on the original Greenland Jacket, and has the same cut as the first one Fjällräven’s founder Åke Nordin made from a piece of durable tent fabric at home in Örnsköldsvik in 1968. 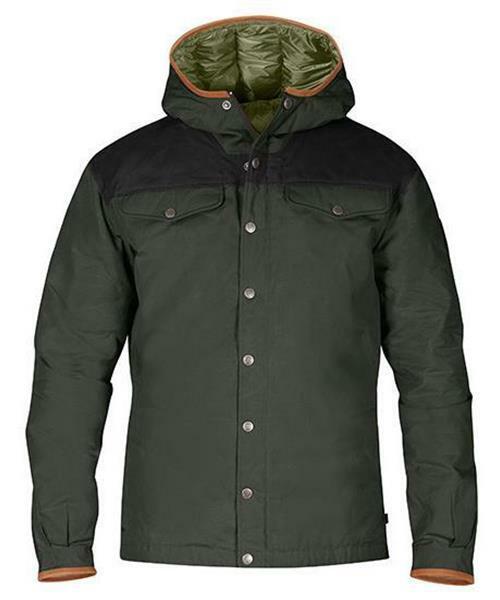 This padded jacket has 800 cuin of high-quality down and is suitable for the colder months of the year. The outer fabric is hardwearing, wind and water resistant G-1000 Eco, made from recycled polyester and organic cotton, and the lining is light, pliant Pertex® Quantum-polyamide.The jacket has a fixed hood and zipper with buttoned flap at the front. Smaller items can be stowed in the two chest pockets with flaps and the jacket also has two hand pockets with buttons on the sides, which are good for warming hands in on cold days. There is also a zippered inside pocket. Edging in natural-toned leather around the hood and sleeve cuffs. The lower hem and sleeve cuffs can be adjusted with a button. The jacket can be impregnated with Greenland Wax for extra protection against wind and rain.